SLUUUUUUDGE METAAAAAAL I mean really, what more is there to say? 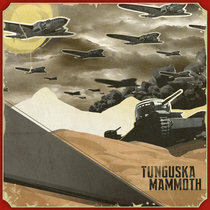 Few bands can capture the appropriate vibe for sludge metal yet Tunguska Mammoth pull it off with aplomb. Their music is fiery, passionate and explosive with riffs that are just to die for. Best listened to 'As loud as possible' Tunguska Mammoth are the kind of band I love not for their finesse or technical skill but moreover for their ability to reach out and rip my heart out with claws made of steel. These guys are vicious and unapologetic about it, listening to Tunguska Mammoth is a bumpy ride but these guys get the mix of groove and ferocity that sludge metal needs to have. Worthy heirs of Black Sabbath (Even if they don't really have much in common with the band) the future seems bright for these Quebecois metal masters. The way these guys rip into their songs and dig into your soul is impressive and if you want a band who have the groove neccesary to take things to a new level then Tunguska Mammoth is the group for you. In less time than it took to play one of their songs I fell in love with them and I'm sure you will too!